Agile DVD to AVI Converter is the handy and powerful software for converting DVD to AVI (AVI,DivX,Xvid) movies with perfect output quality and amazing speed. This software allows you convert video files to AVI (AVI,DivX,Xvid) as well as M4A,WAV, audio fast and easy by 3 steps! The converting process is easy to handle. You just need to click on several buttons to complete the conversion and convert movies from DVDs to computer. 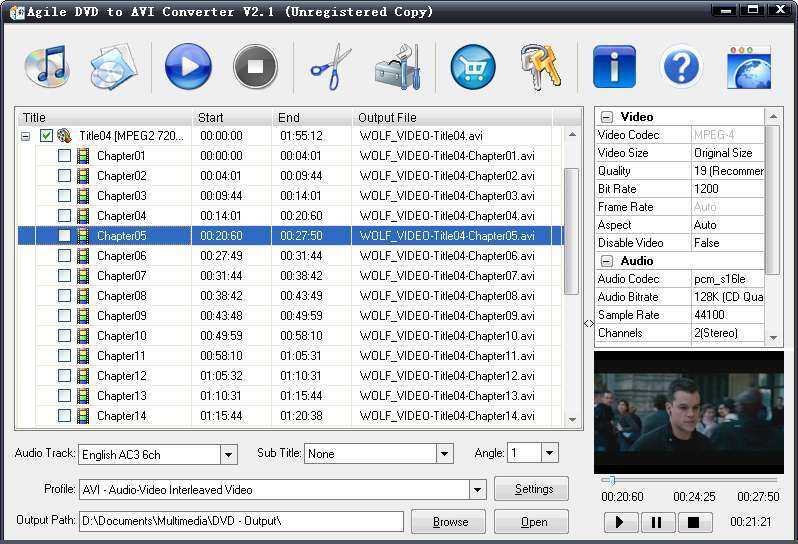 An easy-to-use DVD video converter for AVI (AVI,DivX,Xvid) converting. ...... It supports AVI format for PC, Lap-top, PDA, Pocket pc, etc. completely. Besides, It is easy to rip a part of the DVD movie by setting the Start and End Time, while, it means you can also split the DVD into several segments for convenient storing, distributing and sharing. As a superb DVD to computer converter that worth every penny, Agile DVD to AVI Converter is especially made for those who haven't used any converter before. It would save you money and time once and for all. Qweas is providing links to Agile DVD to AVI Converter 2.1 as a courtesy, and makes no representations regarding Agile DVD to AVI Converter or any other applications or any information related thereto. Any questions, complaints or claims regarding this application Agile DVD to AVI Converter 2.1 must be directed to the appropriate software vendor. You may click the publisher link of Agile DVD to AVI Converter on the top of this page to get more details about the vendor.